Robin Sparks organizes writing retreats and workshops all over the world, and this October I am the speaker at her Bali writer's retreat. Many writers would like to make time for this type of break, so I thought you might like to hear more about Robin and Bali. I have a Turkish based company called Oneworld Ltd. I set up writing workshops around the world, most recently in Bali and Turkey, two of my favorite places on the planet. I provide private flats for short term rent to global travelers in San Francisco, Istanbul and Bali. 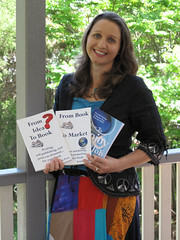 I am a freelance writer currently writing a book about my search through 4 continents and 12 countries for a new home. Why are writing retreats important? Writing retreats are a time to focus solely on your writing accompanied by other authors and top notch instructors. They are an excellent way to recharge and kick your writing up a notch.The perfect vacation for me and many people I know is one with a purpose – where you can relax, learn and be inspired. I began organizing writing retreats in 2002 because it was on a photography retreat 15 years ago where I found the inspiration to write for a living – and where I learned from the other writers there, how to do that. Can you tell us a bit about the Bali retreat in October? This retreat is for writers who are boggled about how to get the book out of their head and out into the world. It will be full of information about how to bypass the traditional publishing bottleneck in a way that will grab the attention of traditional publishers, should one wish to go that route. Current conditions are such that publishers are looking for authors who have already established a platform and following. We will show authors how to prepare a platform and create buzz so that their book will take off and be launched successfully into the world, with or without major publishers. What is Bali like as a holiday destination? What is so special about it? Bali is a magical place – beautiful, peaceful. It is but a tiny speck on an atlas, yet, it is known world wide for its idyllic nature. I myself have searched the world for 10 years for the perfect place for a home away from home. Bali comes as close as any. It is warm and tropical, with beauty etched into every inch. Architecture that integrates the indoors with the outdoors. It has a culture that remains unchanged from hundreds of years ago. Ubud, where the retreat is based, means healing, and true to its name it is a healing mecca where the energy is very conducive to change. The Balinese still observe spiritual rites and practices putting them above all else. Is Bali a safe destination? Entirely safe. Bali is Hindu. Hinduism is tolerant of all religions and beliefs. Women can walk anytime day or night and never have to worry about their safety. You are much safer here than in most western countries. Physical assault is virtually unheard of on the island. People leave their doors unlocked…we hear nothing of the muslim oriented goings ons in the rest of the world. Bali is sort of a bubble where tradition and culture go on as they have for hundreds of years, oblivious to what is transpiring in the rest of the world. It is gorgeous, quiet, private…rooms are surrounded by magnificent gardens. Seemingly away from it all, while only 5 minutes from the center of Ubud. The staff are quiet and attentive. It is luxurious without being ostentatious . There are regular shuttle buses into town. At the Kumara Sakti Resort, you’ll be blown away by the natural beauty….all your worries will be taken care of, leaving you free to write and learn. Each room is different, and each private, surrounded by garden and some with rice paddy views. Each has a terrace and guests may choose to dine alone or with the group in the outdoor dining area. There are two pools and a yoga pavilion where we will hold our class meetings. It is situated on a hillside – the rooms are graduated on a hill. It is on the grounds of a Balinese prince’s home. Some shared rooms, some private with all the conveniences of a fine hotel – A.C. (although not necessary), hair dryers, refrigerator. Outdoor dining area. Delicious, organic, and healthy. Bali is very health conscious and there are numerous organic farmers. There are many international restaurants with cuisine that rivals that of some of the world’s most classy cities. It sets a high bar for quality and at Kumara Sakti, the trained chefs are well versed the preparation of food that is of the highest quality. What kinds of cultural events will we be doing during the retreat? We will attend a Balinese dance performance at the local temple. Participants will receive one free massage and can opt for more at the on-site spa. We will take a walk through achingly lovely rice paddies to the fabulous open air restaurant perched high above the rice paddies for a luncheon. The rest of the time we will be discussing our books and how to get them out in to the world. There are oodles of things to do for those who wish to come before or after the workshop. And if anyone wishes to go to the market or attend the many other activities in Ubud, they only need as the hotel staff to help them. The Ubud Writer's Festival is on after the retreat finishes. Ubud inspired the last section of Eat, Pray, Love because of its magical qualities and the place where Elizabeth Gilbert fell in love. The Ubud Writers Festival promises to feature some amazing authors and people in the publishing business..keep an eye on their website as the full program will be up in early August. This is to be the fourth year of the writers festival. Last year featured Vikas Swarup, author of Q& A, which went on to be made into the movie Slumdog Millionaire. The students of Write and Sell That Book Now! will get 10% off the package price for the Writers Festival. The theme is of this years writers festival is Harmony in Diversity. The International Publishers Forum will run a ‘Meet the Publishers' area for 3 days, where writers will have access to international publishers, agents, designers, and other industry representatives. There will be an emphasis this year on Digital Publishing, the perfect segue to our workshop. Other workshops will cover writing craft, self-publishing, online promotion, and blogging. What will the teaching sessions be about? Write Your Book: How to get creative and find inspiration, the psychology of writing, dealing with blocks, writing exercises. Plus how to practically write your book: tips and techniques for writing, outlining, editing and structuring your book. Publish Your Book: The publishing quadrant including: traditional publishing, self-publishing, print-on-demand, ebooks and digital publishing – what’s right for your book. Detailed session on how to publish ebooks, getting your book on the Kindle and more. How to Build Your Author Platform: The Author 2.0 Model and how to build your platform so book buyers (and even publishers) will come to you. Why Simon & Schuster want you to blog, social network and use video – and how to do it better than most other writers so you stand out. Plus, Author Tech Masterclass when you can build that blog, hands on help with social networking, videos and more. Making Money as a Writer: How to build a business online as an author, multiple streams of income, tools and techniques for selling on the internet. There will also be informal sessions every evening to share and discuss your work in progress, as well as wonderful food and time to relax. Basically the retreat is for people who want to get their book finished, jumpstart their author platform building and actually make a business from writing. Images: All images from Robin Sparks, Joanna Penn or Kumara Sakti resort. I’m interested in knowing more about your writers retreat. How long is it for, which month. I would like to book before Aug, but I don’t see info on dates and number of days. I have already published my Memoir, Bird in a Banyan Tree, in India. Had I been better at marketing, it could have been a best seller, it got great reviews and is selling on Amazon with 5 star rating. I want to sharpen my writing craft and write more. I await your early response.